Throughout the month of October, I will be featuring products with a portion or all of the proceeds going toward various breast cancer awareness charities. Much talk has been made of Ojon Oil -- a wild-crafted substance used by the Tawira Indians of Central America for over 500 years. This fabulous oil helps to restore, revitalize and fortify hair. So, of course, the Ojon Pink Ribbon Revitalizing Mist called out to me when I found out it contained this amazing product -- and I simply had to check it out! This leave-in conditioner can be used in many ways. It's meant to refresh locks that have been through a variety of activities -- sleeping, working out or even going to smoky clubs! A few spritzes of the light mist onto dry hair will take care of a number of problems almost instantly. I decided to put it to the test after sleeping on my hair. And let me tell you, this is no easy feat as my hair is a total disaster in the morning. But I uncapped the bottle, spritzed the spray on my hair and let it do its thing. I WAS AMAZED. My hair went from looking coarse and, well, like I had slept on it, to utterly fabulous in a matter of seconds. I didn't even need to blow it out or take a flat iron to it again! Better still, the sweet coconutty scent is delightfully intriguing and fresh without feeling cloying, and it makes me feel like I sprayed perfume on my hair. 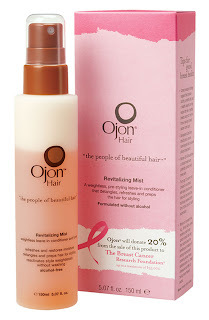 Throughout the month of October, Ojon will donate 20 percent of sales from each bottle of Ojon Pink Ribbon Revitalizing Mist to The Breast Cancer Research Foundation, up to a maximum of $35,000. Ojon Revitalizing Mist retails for $48 at sephora.com.